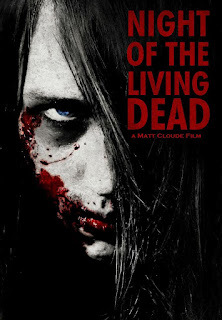 Matt Boiselle If the almighty one himself, Mr. George A. Romero, had struck a deal with the devil many moons ago to reap the rewards of EVERY zombie movie that had been put out after his 1968 classic, he would be a rich........well, he would be a LOT richer. While it appears right now that the release date on this remake will be October 1st, 2012, we here at Zombies & Toys will let you draw your own conclusions as what to expect after viewing the teaser trailer which can be accessed by clicking on the pic. Distributed by V2 pictures and re-imagined by director Matt Cloude, this film claims to not only pay homage to the original spookshow, but expand on the storyline to further delve into what happened the night the dead returned to walk the earth. While boasting mainly an independent cast, the movie does have one rather huge name in the credits, Judith O' Dea, who played Barbara in the Romero-helmed classic. While NOT to be confused with Night Of The Living Dead 3D: Re-Animation, which is also releasing this year and stars Jeffrey Combs and Andrew Divoff, zombie fans should be appeased at another opportunity to witness some undead carnage on-screen.